The process of forging metal into shapes possesses a surprisingly long and storied history. For example, the method of hot rolling can trace its protracted existence all the way back to an enigmatic Italian polymath named Leonardo da Vinci (you may have heard of him), who reportedly invented the rolling mill one lazy day in the 1400s. NASA is now 3-D-printing spare parts up at the ISS (International Space Station). And in zero-gravity environments. And some of these parts are small gears and actuators, for starters. Every indication is that the list of power transmission-type parts to be converted will soon grow. The complete technical calendar from the March/April 2015 issue of Gear Technology. 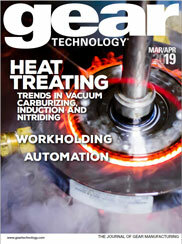 The complete Industry News section from the March/April 2015 issue of Gear Technology. It was late November in Northern Italy, and everything was coming up vinegar oil and high-performance cars for Cory Sanderson and the 11 other members of his Yankee armada.